Malorie Blackman is the Children’s Laureate and the author of many books, though the most famous of which are probably the Noughts and Crosses series. I read every single one of her books when I was in middle school, so aged 11-13. Every time my class had to go to the library I picked up another one of her books so it was kind of strange to read something from an author I haven’t read for almost ten years. 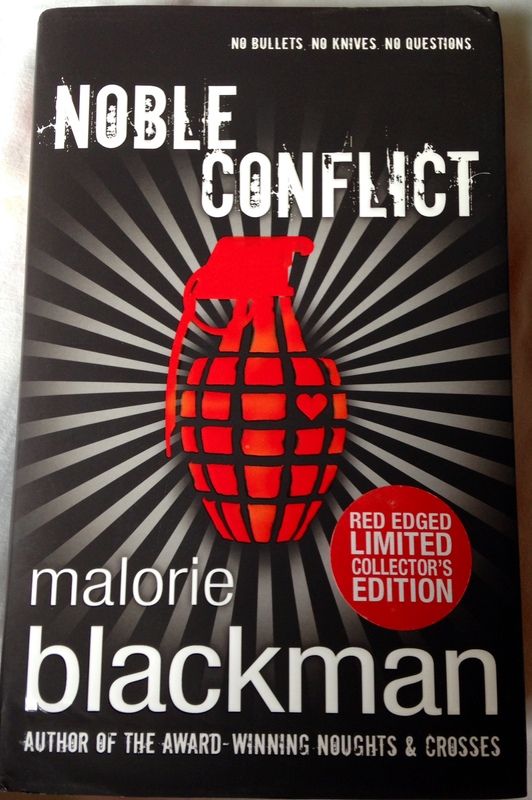 I picked up Noble Conflict solely so I could meet Malorie Blackman at YALC and get it signed but then I went and read it in three days. Noble Conflict is a dystopian YA novel that follows Kaspar. After years of war, Kaspar has grown up in a society based on peace but beyond the city walls there is a group of rebels that want to end that peace. It’s up to the Guardians – an elite peace-keeping force – to make sure that doesn’t happen. Kaspar has joined the Guardians and believes in what they fight for. That is until he meets Rhea, a deadly rebel, and begins to see visions and memories of a world very different to his own and he starts to question everything he has ever been taught about what he, as a Guardian, and the rebels are fighting for. The story is very faced paced, in fact there is a battle in the first chapter which helps to immediately draw you into the world and meet various characters. I like that there isn’t the immediate sense that Kaspar’s society is wrong or “evil” like you sometimes get with dystopian novels. It is his everyday life and in between some chapters you have extracts from the history books that Kaspar must have read so you slowly get the back story without any needless exposition. I found it refreshing to read a dystopian novel from a boys point of view – I know there must be some out there but I have yet to read them (also I never thought I’d be wanting more stories from a male point of view). Kaspar is smart, empathetic, and just wants to do a good job as a Guardian. He is loyal to his friends and his superiors but also isn’t afraid to ask questions and poke his nose around in places that it probably shouldn’t be. Another thing that I liked was that Noble Conflict is a stand-alone dystopian novel, I don’t think I’ve read a YA dystopian that wasn’t part of a trilogy or series before (or at least not for a long time) so that was very refreshing. It’s been a while since I’ve read a book when a line has made me suddenly stop reading because it’s so perfect and true. At the end of the novel there was some very poignant lines, my favourite (which can’t really be a spoiler) is “Books and knowledge don’t make for a safe world. Just the opposite. Books and knowledge are facets of the truth and the truth can be very dangerous.” Which is such a wonderful quote and not only echoes the themes of the story but also is very relevant to real life. I really enjoined Noble Conflict, it surprised me, the characters were interesting (I haven’t talked about Rhea because I didn’t want to spoil anything about her story but she is pretty awesome and badass) and it was action-packed. I’d give Noble Conflict 5/5 and recommend it to anyone who likes action packed, political dystopian novels – especially those who would like to read a stand-alone story and not have to invest time/money into a trilogy or series. 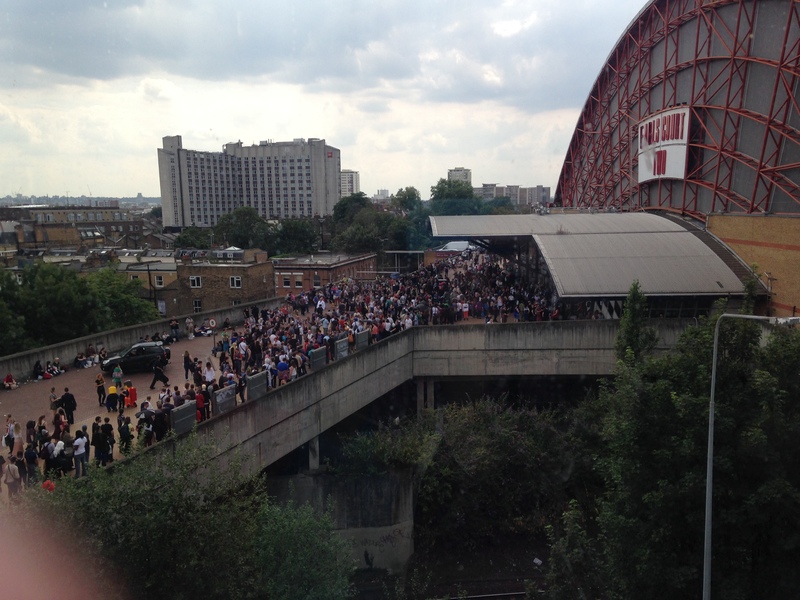 The queue to get into LFCC at 3pm. Yesterday I went to London Film and Comic Con (LFCC) and it was my first time at any type of comic/book/film convention – though saying that, I did go to Empire Big Screen a few years ago in 2011 which was a film convention with panels, screenings and a few siginings but it was much different to what I experienced at LFCC yesterday. So I thought I’d do a list of things I learnt as a Comic Con newbie. 1. If you really want to meet someone/go to a talk – buy the tickets online. I’d thought about going to LFCC when tickets were available online but then forgot about it. When it got closer to the time and I thought about it again, they’d stop selling tickets online in order to make sure everyone receives their tickets in the post so I missed out on some photo shoots and people I’d like to have seen. 2. Queues. Everything about Comic Con is queues. My friend & I hadn’t bought tickets online so so we got to Earl’s court and joined the pay-on-the-day queue at about 8:15am and got into the convention just after 10am – which wasn’t so bad. Then there was queues to buy tickets for photo ops with the various stars – I wouldn’t have minded to meet Stan Lee but obviously those tickets were sold out, so (going back to my first point) if I’d bought them online I’d have been fine. There was queues for signings and sometimes the organisation of the queues weren’t that great and one queue could accidentally blend into another.